Lancaster City Council has been hit by a cabinet walkout after opponents of the council leader tried to get her removed. Conservatives and Liberal Democrats withdrew from the cabinet after a motion calling for Patricia Heath to be removed from office was withdrawn at a meeting on Thursday night. 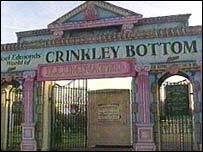 The meeting had been called to consider the council's response to the district auditor's report into the failed Crinkley Bottom theme park. Based around the fictional village made famous by television star Noel Edmonds, it closed 13 weeks after opening in 1994 and cost the council £2m. Labour councillor Ian Barker had called for Ms Heath to be removed after the auditor described some of her evidence to the theme park inquiry as "false and collusive." The Morecambe Bay Independent (MBI) has always denied doing anything wrong. But the motion was withdrawn when the council's officers advised it could be legally challenged. The cabinet now contains just four members made up of MBIs and Greens. Labour has already refused to take its seats.